So you found your perfect business idea. You niched down to a specialty. And you felt good about the decision. Now it’s time to focus on the success factor: your target market. A small business will not go far if it did not go through the process of target market research. If you don’t know your customer for this product, you will not be successful in the long run. Sometimes businesses take off without any business plan. They see spikes of traffic or sales, and then it all plummets down. That’s from lack of planning. You may get lucky and have a lot of sales without this step. However, the people who managed to do this have eventually stepped up their planning. That’s after realizing their businesses won’t last if they didn’t! To avoid the panic, do this before you start your business or launch a product. If you’ve already gone into business and discovered this important missed step, it’s okay. Because now you’re able to pivot your business the right way. As an entrepreneur, you’ll be meeting a lot of people. Whether online or in person, you’ll find yourself in many introductions. Treat every connection as an opportunity to build a relationship. You could be taking to your ideal customer, a partner, or someone who will refer you. If you only say “I’m a designer” then you’ve lost any chance to see where that relationship can go. If you say you’re a visual designer who helps jewelry shop owners with beautiful e-commerce websites, then there’s a better pitch! If you’re making whatever you want to make and then closing your eyes to pull the trigger, you’re gambling. Knowing who you serve helps you figure out what to do next. How will you know if your product is amazing but needs one small tweak? How will you know if your product is terrible and need to throw out that idea for something simpler? Let’s say you have an amazing online video course to teach parents how to get organized. Your content is great but you notice that the engagement is very low. You find out later that your target market consists of busy homeschooling parents with hectic schedules. They bought the course but forgot about it halfway through. You then find out that an email course is better for them so that they get daily reminders of the curriculum. Suddenly, engagement skyrockets and people are finishing your course with great success. A small change can make all the difference. But only if you know who they are. People don’t buy from you if they don’t trust you. It’s as simple as that. If you have a generic email, with generic website copy that targets to everyone, it won’t get you anywhere. You will look like you don’t know what you’re talking about. If you know what their struggles are, you’ll get amazing feedback. Knowing what they want before they even say anything looks magical. You will become an authority in your space and people will remember you. 1. Where do they hang out? When you’re starting from scratch and don’t have an audience, you’ll have to find them. Different groups of people rely on different media to get their information. An older audience who is not tech-savvy will not be hanging out in online forums to get information. Young millennials and teens will not be utilizing LinkedIn for the latest fashion trends. Health enthusiasts will not be subscribed to the Walmart newsletter to find the latest paleo snacks. Usually, if you’ve chosen a niche, you’re interested in the topic and have knowledge of trends. If you know nothing about it, it’s time to immerse yourself in that culture. Study it better before you make this your business! 2. What kind of places do they go to? Again, if you don’t have too much information on your industry, you need to take a step back and learn for a few months or more. Here’s the thing. If you know your audience well, you can even predict how they’ll react in certain situations! This is a fun way of honing down on a customer. These profiles are not set in stone. They can develop to different people over time. This doesn’t have to be perfect, it’s just a guide. The main purpose of this is to help you feel like you’re speaking to only one person. It’s the secret weapon to humanizing your brand! Extra credit: find a photo of this fictional person! 2. Why is a profile necessary? Now you can talk to someone when you’re thinking of writing an article, website copy or an email. If you know what they’re like and what goes on in their everyday lives, then you can speak their language. For example, experienced graphic designers have a certain lingo. You can mention mood boards, color palettes, vectors, kerning, typography, and so on, without having to explain yourself. It would be different if you were targeting people who want to learn about graphic design. Then you would have to use a different vocabulary as an introduction. The words mentioned above may have to be explained in articles, courses or emails. This isn’t very fun for people who tend to compare and feel insecure. But this is not the time to feel bad that your business doesn’t look like someone else’s! It won’t and it shouldn’t. Competitive research is for knowing who you serve. Start easy and choose only one or two businesses. Take note of what it is they’re doing. They have a specialty and a pitch. What is that? They have a target market. Who are they? The easiest way to find this is the headline of their website. They’re talking to someone and then giving a solution. Now, find out how you can do this better! For example, if they actually don’t have a clear headline and purpose on their website, write that down. You’ll have one advantage over them already if you implement that on your site. Are there features you don’t see them offering? Maybe the quality is a little off? If you have a product or information business, the fastest place to look is on Amazon. Look for the 1, 2, or 3 star reviews and see why they didn’t give it a good rating. Is there a way you can improve on that? The point is to find what the target market wants. Always keep it customer-focused and don’t let the competition tell you what to do next. It’s easy to offer what others are offering. But maybe they’re not listening to the needs of the people. Remember, let your customers choose, not your competitors! Ask: As if you’re speaking to a friend, ask them what they’re struggling with, what they want, or any requests they have. Tell them to reply to the email and that you will read, or better yet, respond to all the emails! Survey: Send them to a survey. Make one through a form or site like SurveyMonkey. Most people are willing to take this, but you can always give them an incentive. Don’t give them any free stuff. Your ideal customer will be buying from you. So your incentive can be a discount. But if you offer something for free, they have the wrong motive. Segment: With Convertkit*, you can segment your list. For example, you can ask them what they want to know more about. You might list something like: more free stock photos, how to take stock photos, how to edit photos. When they click on one of those links, you can “tag” them to figure out what they want. Now you’ll be able to tailor the content according to that. Track: In the subject, say you have something they might be interested in. Talk about whatever it is you offer in a broad sense. Then give them a few links to blog posts, landing pages, products, etc. Track what they click on to see what they like. If you don’t have an audience, no problem. Do some research online to find out what they’re talking about. Go to popular sites on your niche with an active community. See what kind of questions they’re asking the authors. Don’t just look. Write them down in a document. You can turn these into product ideas and content. Use their vocabulary when they asked those questions. Find out which of these are worth pursuing. Now that you’ve gathered information on your target market, make sure it’s not limited to one or two people only. To make sure this audience is going to make your business successful, you can look up the keywords they were talking about. This is one of the best tools to make sure a topic is relevant today. Let’s say you’re selling minimalist jewelry. You heard someone in your market talking about affordable gold-plated necklaces. Look that up in Google Trends and see if the search volume is high. If it is, then that’s the green light to pursue it! This is another great marketing tool to see the social buzz around a topic. Buzzsumo is free with a limit to how many topics you can search a day. If you need to search a large volume, then they have a paid account. When you search a keyword, it will make a list of relevant websites and a number of social shares. If gold-plated necklaces are shared a lot on Pinterest and that’s where you know your target market hangs out, it’s another green light! Now that you’ve gone through all that research, it’s time to make a solid plan around your audience. Ask yourself why they should choose you. How is it better from others out there? Be strong in your words. Tell yourself that you know them so well, they will need this. What you gain from all this time spent looking for your ideal customers is the confidence to sell. 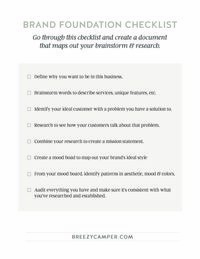 From this, you will have a good idea what to write on your homepage. If you were paying attention, this would be a headline that is speaking to your readers and giving them a solution. You will also craft your perfect elevator pitch. You know what you do, and now you know who you serve. Lastly, don’t get too hesitant on making it a specific group of people. Remember that it’s just a guide. However, if you have a spectacular product or service, there will be plenty outside your target market who will buy from you. This is a good exercise to do annually as you gain more trust from people. I wrote an in-depth guide on how to brand your business as a newbie entrepreneur. We go over your how you can define a voice, mission, style, and more. 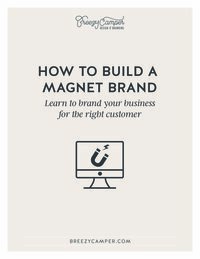 Check out my DIY Branding ebook now!